A little info about it: let's just say I love it when a plan comes together. My initial thoughts were how do I make a frog fly that will cut a "V" in the water on the retrieve, slightly sink backwards when at rest, but still manage a kicking action when pulled? Using a 2/0 hook commonly used for poppers, I got the notion to use rabbit zonker strips for the legs, but tie them with the skin side out so I could glue into a v-shape which will pull back when pulled forward, creating a kick. Tied in a few small wraps of .020 lead wire near the back, only like 5-6 wraps in order to add weight to sink back end first. But, this being a topwater, I also had to think about how to keep it bouyant enough. So, began the long task of stacking deer hair. Went with both green and yellow deer hair, and stacked it in larger bunches in order to really pack it and really give it buoyancy. Took time to cut it into that great frog shape, added the 3D eyes, gave it the bathtub test and I can say that it works exactly as intended!! Looks AMAZING in the water. Let's hope the bass think so, too. 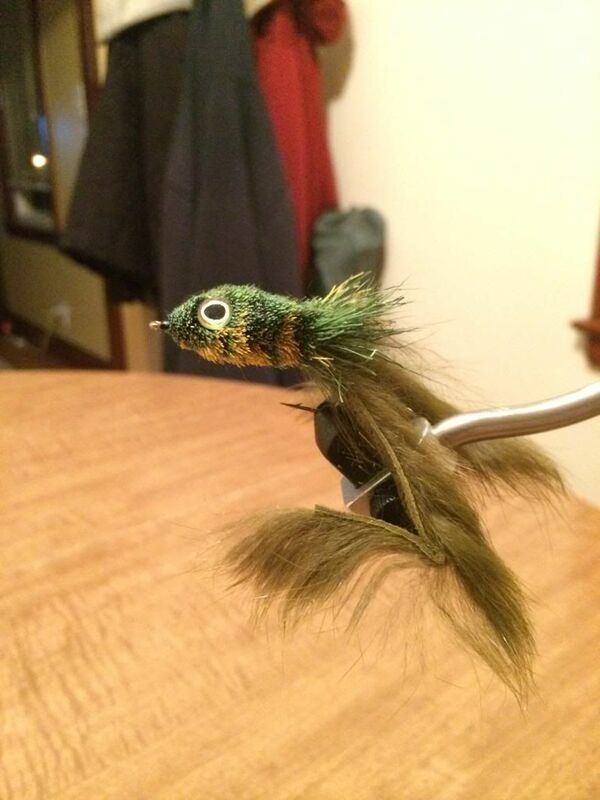 Very nice work with the flytying. You have come a long ways in a very short time in both flyfishing, fly casting and fly making. You definitely have a feel for this and one day you will be a very skilled flyfisherman. Congratulations! 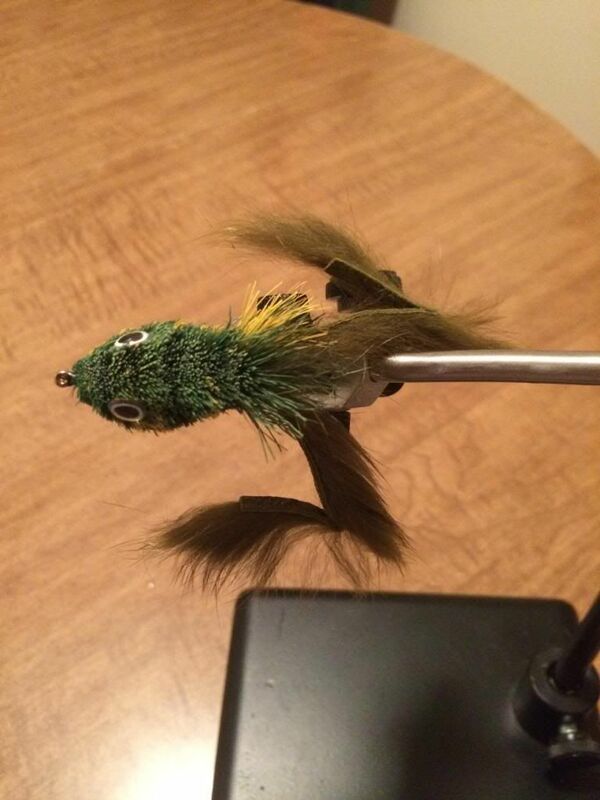 I like the new frog popper as I think the shape is unique and the kicking legs are a good feature. However, I have some doubts as to how it would work if the fly gets water logged (after an extended period of time fishing, and sitting in the water, or with fish slime on it) as the rabbit skin will pick up a lot of moisture and will become very heavy when it gets soaking wet. Nice job stacking the deer hair but I think the head might be a little too small to float really well. Nowadays we have silicon floatants and this is a great help in keeping the large poppers floating. Better get a good supply of those before you head out with your froggie! If you are interested in top water popper fishing for Bass and other similar fish you should also look into making some popper with weedless features. This way you can cast your popper deep into the lily pads and tree snags without the fly hanging up on you. They are quite easy to make and this will double your fishing enjoyment when you fish over the lily pads, fallen logs and snags...where the big bass love to hang out! I don't blame you for going out fishing everyday as we are coming into the good fishing season and I would do the same thing if I could! Better think about getting yourself a new computer though as you are missing some great fishing fun on the Forum....and we all miss hearing from you. The spawning fish are still somewhere on my computer and maybe one day we can put them to good use! Keep in mind, it is not a popper, just a topwater fly. I didn't square up the mouth or head to push water or cup it to create a popping sound, but rather more coned the head so that when you pull, it creates a wake, a "V" shape of you will. Almost like a quick dive, like a Muddler Minnow. That's the intent. I do agree with you 100% about the legs though, and it was certainly one of my concerns. Question arises...if I also sprayed the floatant on the legs, would it help a bit to limit the water logging do you think? I'll be honest, especially with it being deer hair, I'm not expecting it to have a long life. Will only take a few hard hits before it's ripped to shreds I think. And yes, you are correct. I really should have tied a mono weedguard. Didn't even think about it though. Ah well. Next time, live and learn right? Haha. Guess I'd just better avoid heavy weeds for now lol. Once again, I thank you very much for the insight, only makes me a better fly angler and tier in the long run. And yes, I'm hopin that the stars align soon and the deal I have in place for a new computer goes through. If all works out, hopefully I will be rejoining the ranks very, very soon and contributing all that I can!! You certainly tye a lovely fly for a beginner. I personally hate tying deer hair flies because of the mess it makes. If you want a fly to pull across surface and create a v in water, you could try the fly we use in Scotland its the Boobie, it is deadly. We fish on various lines. Ie on a floating line it goes on tail then in between a couple of buzzers, on an intermediate line set up the same. But we also use a fast sink line with about 3ft leader then fly, let it sink to bottom then retreive slowly, the action is of a minnow going up and down in water. To tye it is dead simple and no mess. All you need is either ethafoam or polystyrene balls and a pair of old tights. 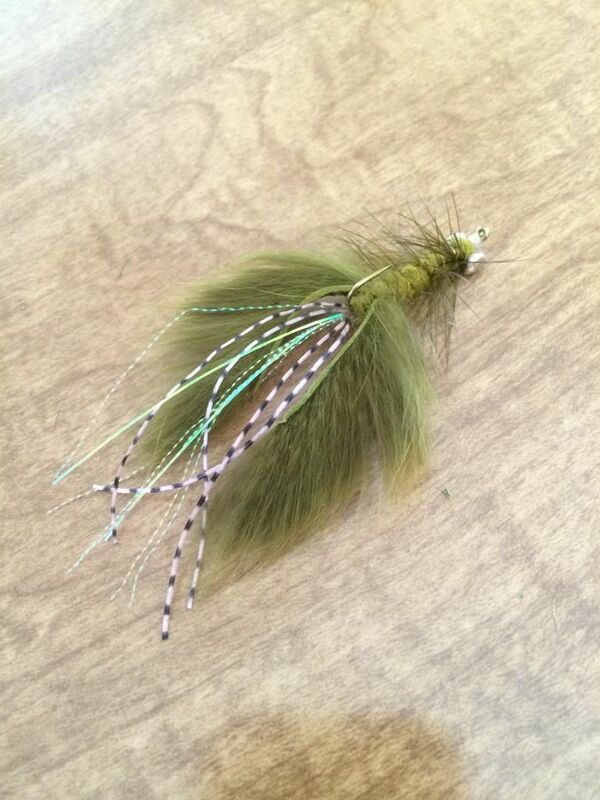 Tye the eyes at head of fly add marabou for tail and fritz or chennile for body. Simple but deadly. Thank you much, Uncle Barnsie! Yeah, deer hair does make a mess. I found a way to sort of keep it under control though. Basically, I set my vise (it's on a weighted base) inside of a shallow box top, such as one you'd use for gift wrapping. I do all my cutting and trimming over the box top, this way the bulk of the hair falls into the box, making for easy cleanup. I do like spinning and stacking deer hair as you can make some pretty nice and effective flies with it. Makes me use my artistic background, as does all of fly tying. Stanley really hit the nail on the head and figured me out, suggesting that I try tying flies for that very reason. I really enjoy fly tying, and kind of experimenting especially know that I know the pros and cons of many different materials. Like everything I do in life, I jumped in at full bore, practicing, learning from mistakes, thread strength and uses, etc. We'll just say that fly tying really speaks to my meticulous nature haha. I actually tried this frog yesterday evenin at Lake Kirsty, mostly to get a good handle on how it works in an uncontrolled environment and of course, to catch fish. Happy to say that it moves and works exactly as intended! Creates a really nice "V" wake one the surface as you strip, the legs kicked great on the short strips, and at rest it did sink very slowly, back first with the head keeping it above water. Granted, it certainly did get a bit water logged in the legs just as I feared would happen with rabbit zonker strips (and which Stanley also pointed out), but it didn't lose much action if you kept it moving. Also, missed 3-4 strikes on it, my own fault though because I strip-set too quickly. I know better than that haha. Even had a Largemouth that appeared to be in the 6-7 lb class give a really good follow, but never hit. Pretty easy to tie, just a little tricky wrapping the dubbing underneath the hook point. That one is a #6, weighted with dumb bell eyes in the tail end near the hook eye. Gonna throw 'em at some Smallmouth. We'll see how it goes!